Published Monday, December 19, 2011, OK personal/derivative use; link www.lovethatimage.com. 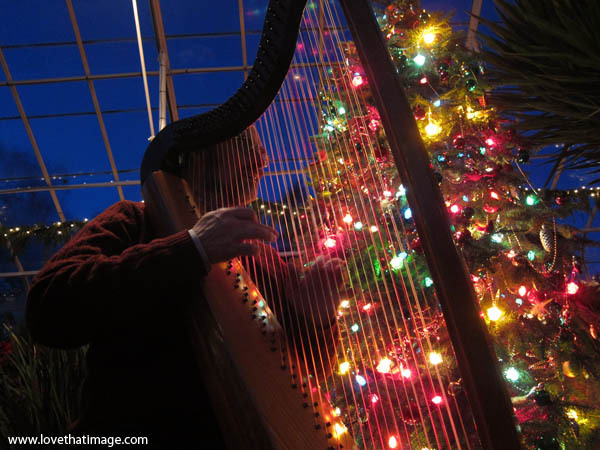 The other night at the lighting ceremony at Seattle’s Volunteer Park Conservatory, there was magical harp music. In that mysterious and romantic environment, it only sounded more beautiful, if that is possible, than harp music usually does. Wish I had a video of it, but I’m a still camera kind of gal, at least so far. I like the special mood of this photo and I’m calling this my Best Post of the Week. Take a peek at Thursday Challenge (Light), Color Carnival, SOOC Sunday (straight out of the camera), Ruby Tuesday, Pink Saturday, Mellow Yellow Monday, all tons of fun photoblog memes. 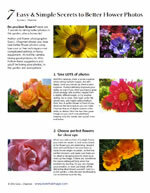 Before you go, be sure to try a new tag or category here at Sara’s Fave Photos, just for a lark. Wow, what a beatuful pic! I love its design and colors! what a great instrument, pretty lights too 🙂 am sure you are enjoying the music from the harp player 🙂 Visiting for MYM, hope that you can return the favor too. Love this composition. Well done. Great perspective. I love the harp! I bet the music was wonderful! Wow! That’s a wonderful picture! Love the light reflecting through the string. Heavenly! I can almost hear the music! beautiful!! I can hear the music now!! Wonderful image. Have a wonderful Christmas! This is lovely ! I love the colors and the angle.